Once considered the pinnacle of family entertainment, the Variety Show packed out theatres and had millions hooked to their television sets. But now, in this modern era of instant, flat screen, comfy sofa viewing, ‘variety’ only appears to exist on ITV1 ©Simon Cowell. Until now. 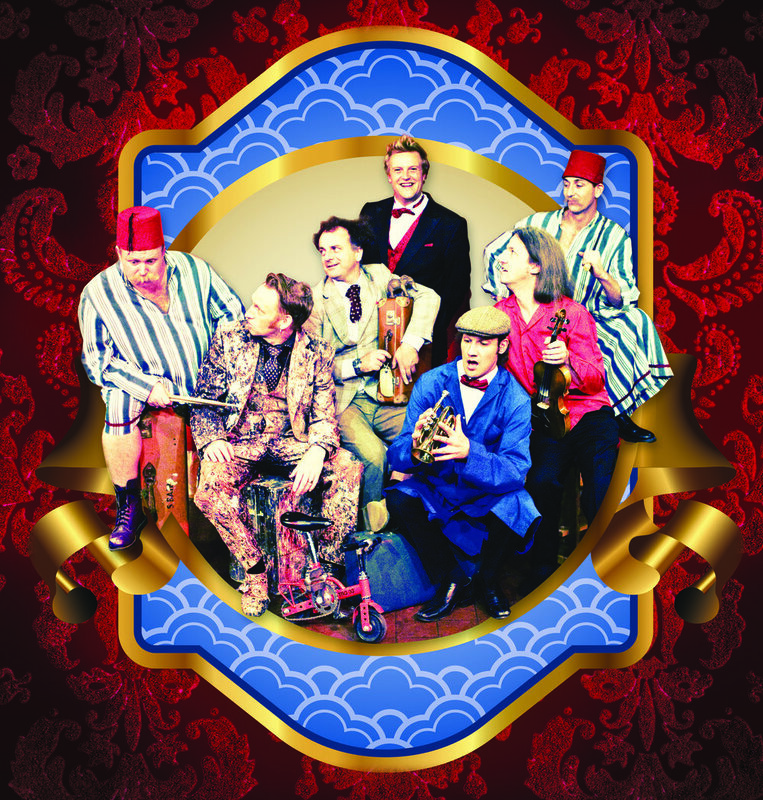 'The magnificent seven' (The Stage) have wowed audiences since 2010 with their controlled chaos and wonderfully funny variety shows. Tiger taming. Bullet catching. Dancing Horses. Original live music. Circus tricksters. Acrobatic Elephants. Astonishing human skills. Miniature cowboys. Sing-a-longs. A strange man who genuinely goes by the name of Treehead. Knife Throwing. Cling film escapology, piano playing dogs and that's just the first half! Brought to you by award winning West End producer Mick Perrin Worldwide ( La Soirée). Seen and loved around the world, Slightly Fat Features were awarded the ‘Prix Coup De Coeur’ at the Just For Laughs Festival (Montreal), 'Best Show' at the Great Yorkshire Fringe (York) and have countless standing ovations under their (buckling) belts from venues across the UK including at The Roundhouse (London), Tobacco Factory (Bristol) and at The Pleasance at the Edinburgh Fringe Festival. Richard has been amazing audiences for over 20 years. He has performed at many theatre festivals and venues across the world including at the famous Covent Garden, Edinburgh Fringe Festival, The National Theatre, and the Cape Town Street Theatre Festival. Other highlights include being part of the Rolling Stones World tour, starring in BBC Open University, making his feature film debut in 'Back To the Garden', appearing several times with Spymonkey, starring in several BBC radio plays and performing in the West End in the acclaimed play Monsieur D’eon and as Evel Kinell his stunt man character. He works with Millennium FX regularly and recently has been an belly dancing Orangutang in a chocolate commercial, an Ape in Dubai with Dom Joly, been in Dr Who on BBC1 twice, with David Attenburgh and appeared in the new Star Wars! He is also half of the double act Streetcomedy (with Goronwy Thom), who have just won the peoples choice award at the International Streets of Durham Festival, Arts Fresco at Market Harbourgh and at Landshut in Germany. The multi-skilled talents of the wonderful Robert Lee have been utilised to bring hundreds of projects and live shows to life. A brilliant live instrumentalist and composer, he has produced over 250 songs for use on TEFL language courses, taught to millions of people all over the world, written scores for many theatre shows, produced albums for other people (and a few in his own name as well) and performs in various crazy live endeavours! He has produced two full length musicals WOB and Vaudevillious. His original music is currently touring theatres and schools across England in the show “Upstairs in the Sky”. He has played with many bands including Herbie Treeheads Disaster Band, The Fantastic Flea Band, with Ergo Phizmiz in Gargantua and recently he played an improvised classical piece of piano- live- on the biggest radio station in Germany. Over his performing lifetime, Herbie has gathered an underground following of fans. A cult figure at festivals across Britain, he has performed at countless venues around the world. His unique style made him the star of the hit BBC One TV show Xperi-mental, where he tested crazy science stunts as a mad professor. He created the worlds first Dinosaur Circus- a hit of the Edinburgh Festival Fringe 2004 and his theatre production Cherubs Garden was also a hit at the Edinburgh Fringe Festival and later transferred to the National Theatre. As part of this show he produced an album of original music for kids and adults. The album 'Sleepy Songs and not so Sleepy songs' was produced with Robert Lee and is available to buy online! The Herbie Treehead Disaster Band have received much acclaim from audiences around the UK and the eight piece band plays regularly at theatres and festivals. Jon has appeared as the Artist in Action since 2000. He has performed his show around the World at festivals, in cabarets, on numerous TV shows and to a President. He studied fine art in Exeter, worked as a pavement artist, as a scenic artist and then created his own unique live performances. He has appeared on television worldwide and on BBC Breakfast, The Slammer, Glastonbury and Blue Peter- twice! Recently he has created a one man show, 'Curioddity' which played at Jacksons Lane, Brighton Fringe and The London Clown Festival. His company 'Haywood hix' made a large scale outdoor show which played across the country in 2013/14. 'Here and gone' another company he is part of create bespoke large scale pieces of art and have been featured in the press worldwide for their bizarre and beautiful pieces.